I hope you had a fantastic Memorial Day! I don't know about you, but I never wanted our weekend to end. We took a drive out to the NC coast and spent the long weekend with friends. It's been a long time since we've spent more than a day-trip to the coast. In fact, I think it's been years since I've actually been in the ocean more than toe-deep. I feel like we're very geographically lucky in Raleigh, because we're only around a 2-3 hour drive to the coast and 3-4 hours to the Appalachian mountains (depending on exactly where you're headed). I almost forgot how scared I could be of the water also. There are just so many critters in the ocean that could be around; the good (fish), the bad (sharks + jelly fish), and the ugly (stingrays). However, after enough hours baking in the hot sun plus the courage of a homemade piña colada (whoa baby it was good! ), I took a few steps in the water until I was knee deep, then waist deep, then shoulder deep. And.... I survived! I had forgotten just how fun jumping over and under waves could be. Although losing my sunglasses wasn't that fun... Darnit John is right again ("don't wear your sunglasses in the ocean"). Sigh. Anyway, overall being at the beach was a blast! While we left the water and sea breeze, the hot sun and humidity found it's way to Raleigh, a place it calls home most of the summer. So we traded out the soups and hot teas on our menu a lot in the cold months and replace it with cold salads, smoothies, and my favorite, frozen treats! It's a tasty evening over here at the Middleton's as I'm writing to share one of my all time favorite and EASIEST sweet treats with you. Last week I'd gone bananas and revealed my secret to the BEST method for storing banana slices. 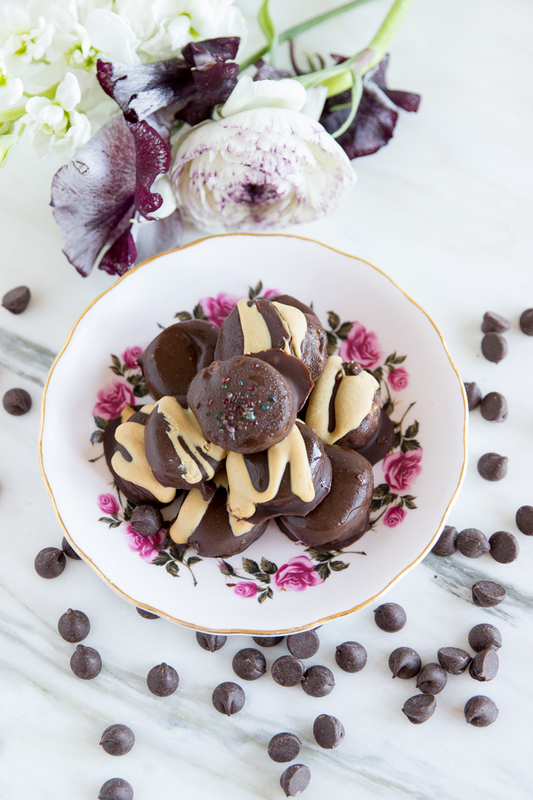 Now, I'm riding that wave on out by sharing THIS frozen banana bites recipe. Let's do this! There are only 3 super common ingredients for these little tasties that you, health nut like myself, likely already have on-hand. It's only 3 ingredients to a delicious + satisfying sweet treat! *plus any toppings you'd like to add like peanut butter (my favorite) or sprinkles! I'll be 100% honest, my banana bites method IS a couple more steps than some other frozen banana bites recipes out there. This recipe is certainly not an adaptation of any other blogger recipe, this method and recipe was formed by my desperation for sweets in college and inability to go a grocery store at the time (too far + not enough time, haha). I typically slice and freeze 3 bananas at a time. I do let them get pretty ripe (as shown in the picture of this post) because I prefer their developed flavor versus a more underripe green-y tasting banana. Once I slice & freeze them, I let them hang out in the freezer for a good 4-6 + hours (of course overnight is always best). When I'm ready to give them a chocolate dip, I measure the 3/4 cup of chocolate chips into a microwave-safe bowl, add 1 tablespoon of coconut oil, then microwave for 30-45 seconds (depending on how strong your microwave is). Remove the bowl from the microwave and give it a whisk until the chocolate and oil bind together and are a silky smooth consistency. Then, plop 2-3 banana slices in the chocolate sauce and give them a flip once or twice so that they are coated with chocolate. Place the chocolate-covered banana bites on the same freezer mat (I use a plastic cutting board like the one below). Repeat this with all of the banana bites. If you want to add a little pizzaz to the banana bites, I like to drizzle peanut butter or shake some sprinkles onto them. If you're a peanut butter fan like me, I really love PB2 for drizzling. PB2 is one of my favorite peanut butters out there because you can add it straight into a smoothie or any recipe you want to add peanut butter flavor. I works well for our drizzle because you can make the peanut butter just a tad runnier than you normally would so that it's easier to drip over the banana slices. 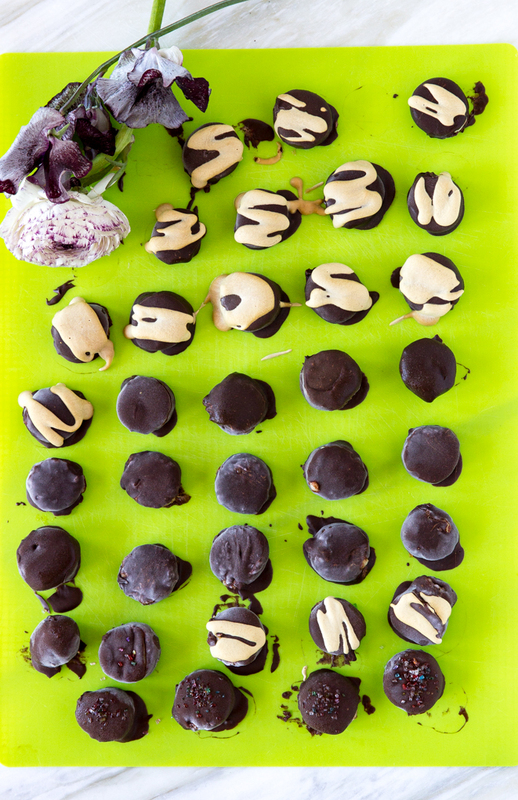 Another benefit to freezing the banana bites before dipping in chocolate is that the chocolate starts to harden onto the slices right away, so drizzling peanut butter or adding any other topping is easier and doesn't melt together with the chocolate. If you want to be an eager beaver about serving these babies as a pool or picnic snack, just slice and freeze them first thing in the morning. Then, give them a dip in chocolate in the afternoon, and then let them chill at least one to two more hours before serving to friends. 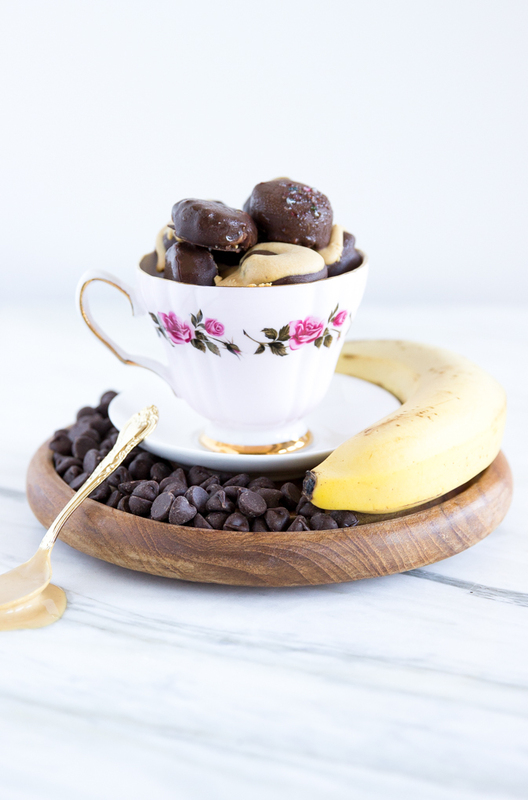 You can make these banana bites SUPER healthy and even lower-sugar by using stevia-sweetened chocolate chips like Lily's. I love their chocolate because it always satisfies my chocolate craving without exploding my sugar intake for the day. You could use another neutral-flavored oil like grapeseed or canola and the chips will melt the same. However, coconut is my preference and recommendation for the healthy fat properties and the sweeter taste. I hope you enjoy! These little banana bites are excellent treats to serve your girlfriends for a gal's night in, picnic or pool party (just keep in a cooler! ), OR just to have around for when you need a little something sweet without busting your calorie or sugar intake for the day. If you make this recipe or have questions about the process, let me know! Comment below, shoot me an email, or DM on Insta. I'd love to hear from you! Here's to easy treats that don't bust your bikini meal prep... ;) Cheers!